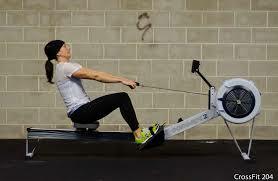 If you have been to your local box or visited CrossFit.com, then you know rowing is a big component in the sport. As you go about your CrossFit workout sessions, whether you are hoping to burn fat, build muscle, or really take your fitness to the next level, one piece of equipment that you should definitely be considering that is far too often overlooked by many is the rowing machine. Choosing the best rowing machine will enable you to build up all muscles in your body as unlike other cardio machines such as the treadmill or bicycle, it’ll work both the upper as well as the lower body. Depending on the resistance you use as well, you can really focus on strength enhancement or work on speed and power. With so many options and the fact that it is a non-impact activity, it’s a great choice for just about any CrossFit enthusiast. It’s a great functional movement pattern as well, so will fit right into the principles of CrossFit. To help you better get an idea of the rowing machine benefits as well as which are the top rated rowing machines, let’s get you the information you need to know. When it comes to physical benefits, you really can’t beat rowing. First, this form of exercise is going to work the quads, hamstrings, glutes, calves, back, biceps, and shoulders, giving you a very complete workout all in one. Because so many muscle groups are being utilized, this also means your calorie burn is going to be very high, which means this form of exercise is excellent for fat burning results. With most of the best rowing machine options, you can also really change up the resistance level that you work against, which means they can accommodate all skill levels. Using a higher resistance is going to mean you focus more on power and strength development, while using a lower resistance level and rowing at a faster pace will have you focusing more on speed. Rowing is going to help to boost your cardiovascular fitness level as it’ll help to elevate your heart rate and keep it there, so you get both strength and endurance benefits all in one. Plus, it’s non-impact, so this form of exercise is not going to put you at risk for back or knee pain provided you are using good form as you go about your workout session. Now let’s talk a little further about the different types of rowing machines to know. When looking at the top rated rowing machines, it becomes clear that not all are alike. Not only will they vary in terms of the quality of their make, but they also will vary in terms of the system they use for resistance. By understanding the differences, you can make the best choice for you. The very first type of rowing machine is the hydraulic system machine. This system is going to use a set of shocks to create the resistance level that you will then be working against, which would appear to be very similar to that of which you’d see used in a car. The nice thing about hydraulic rowing machines is they tend to take up less space overall and are easily adjustable. These models also tend to be lower priced, so good for those on a budget. The drawback however is that you’ll find they don’t always give as smooth of a movement pattern, so in terms of comfort of using the machine, it does fall short. It can also suffer from leakage over time with prolonged, ongoing use, so these can be more likely to break down. Granted, as they are lower cost, they are also more easily replaceable as well. The next type of rowing machine you might encounter is a magnetic machine, which is going to use a magnetic as the main means of resistance. The key benefit that you’ll get with this model is the fact that it’s going to be virtually silent to use. If you plan on using the rowing machine at home and are concerned about the sound that it’s making, this is the model to go with. It’s also a relatively small sized machine in most cases, again, making it an ideal option for those seeking the best home rowing machine. These models will require very little in terms of maintenance, so for a low-key beginner option, they tend to be good choices. Finally, they also offer quite a smooth movement pattern as well – much better than you’re going to see with the hydraulic system mentioned above. The next option that you’ll find and one of the more common choices for use in commercial gyms is the air rowing machines. These are going to be self-propelled by you, requiring the initial pull to get them started and from there, you’ll keep the movement pattern going. One thing that many users of this model note that often gets overlooked as a key advantage is that you’ll get a nice breeze generated from the air wheel, cooling you down as you do your workout. Of course you could always just use a separate fan if you’re too warm, but it is a nice benefit that saves you from having to worry about that. With these models, the faster you begin rowing, the greater the resistance level will be, so they work to help develop strength and speed at the same time. The drawbacks with this model is that they do create more noise and they are also higher priced than some other models on the market. Finally, the last model that you’ll come across is the water models, which are going to most simulate a real rowing machine. Since you’ll be using water as a resistance means, these are the models chosen most often by real rowers for training purposes. As you might imagine, you’ll definitely be hearing more noise with this machine and on top of that, these models do run much higher priced. For those on a budget, chances are they will be out of reach. They also can require more routine maintenance on an ongoing basis, so will be a higher commitment as far as that is concerned as well. They do, however, provide a very smooth action, so in terms of enjoyment of use, they tend to rank as the top model to choose. Finally, these models are also much heavier, so not a model you’ll just transport around the room either. So there you have some of the main types of rowing machines that you should know about and consider as you reach through various rowing machine reviews. It’s a good idea to first choose the type of machine you will consider so that way you won’t waste time on other varieties that won’t meet your needs and preferences. Now let’s move forward and go over some of rowing machine reviews for you to use. If you want a top level air model that’s used by many of the competitive rowers out there, the Concept2 Model D machine may be one for you to consider. It’s a well-built machine that’s designed or ongoing, heavy-duty use, so if you plan on using it daily, it’ll stand up to that wear and tear. It’ll provide you with a performance monitor, which will give you the stats of your session so you can make sure that you are seeing constant improvements over time. In addition to that, you can easily adjust the airflow to the wheel, changing how the stroke feels as you go about the movement. This helps you get a very smooth feel as you do your workout. It’s also well-designed for storage as it’ll fold right up so you can put it into smaller spaces when not in use. If you want to convert this model into one that feels more like you’re on the real water, they also have come up with a Concept2 Slide that you can purchase and use for this purpose. With a 30 day money back guarantee, you can try this model out and see how well it suits your needs. It is higher priced however, coming in at $900 or more depending on where you purchase it. Complete with a 2 year warranty, this machine has everything you could possibly need from a rower. It has a 20 inch frame, so is going to provide good durability as you go about your intense workout sessions and can also help to ease anyone who commonly suffers from knee pain during their workouts. This model comes with a performance monitor as well that is wire-free for ease of use and also comes with a flywheel and damper so you can customize the feel of this machine to meet your needs. You’ll also has a greater range of seat height options as well, which makes it ideal for those who are shorter, taller, or just aren’t as flexible as they used to be. The Concept2 Model E has a quick-release fold up option for easy storage when not in use and comes with a nickel plated chain that will allow for a smooth stride and a longer operating time between maintenance. It also has an adjustable foot rest along with an ergonomic handle, so if you are looking for comfort, this is the machine for you. Just like with the model above, you’ll also be able to use the Concept2 Slide with this machine if you want to mimic a more ‘real life’ water feel and you’ll also receive a 30 day money back guarantee as well. It is higher priced than the model above coming in at over $1200, but if you want a top of the line model that will withstand any intensity of exercise, it’s a great choice. Finally, the last rowing machine option that’s a great choice whether you are just looking to get into shape or you are seeking a Crossfit Rowing machine, is the WaterRower Club rowing machine. Given that it’s a completely natural made rower, it falls more in line with the Crossfit philosophies while still allowing you to maintain an excellent workout. One of the key benefits you’ll notice with this model is the fact that the wood absorbs much of the sound and vibration that you may encounter with other models that aren’t designed to combat this problem. In addition to that, this machine tends to stand up to greater wear and tear due to its all-natural and very sturdy build, so can work great for even the most intense of the trainees. It is a water machine, so unlike the two models listed above both of which are using air, you’ll get that very real life-like feel as if you were actually on water. It is a much heavier machine, so not one you’ll just fold up for easy storage like the two above, so you will need to have more space available if this is your rower of choice. The flywheel itself sits very close to the tank on this model, giving you a very smooth feel as you go about the movement pattern. In addition to that, you’ll also have a performance monitor option that can track your heart rate as well as your stroke rate. With excellent reviews and a price tag of just over $1000 depending on where you purchase it, it’s a great option for those who really want to feel like they’re out on a lake. So there you have some of the main information to know about choosing a rowing machine. If you’re tired of slugging it out on cardio machines or using the elliptical trainer, this machine could just provide you with the excellent change of pace that you’re looking for. Always try and use a rowing machine in a store – even if you are going to purchase online – before buying so that you can get the real feel of it and make sure it fits your body well. I think, I find my desired indoor rower. Keep up the good work.